Don’t miss out on this offer which includes search engine submission for YOURDOMAIN.COM for 12 months. There is no obligation to pay for this order unless you complete your payment by Apr 18, 2013. Our services provide submission and search engine ranking for domain owners. This offer for submission services is not required to renew your domain registration. Failure to complete your search engine registration by Apr 18, 2013 may result in the cancellation of this order (making it difficult for your customers to locate you using search engines on the web). 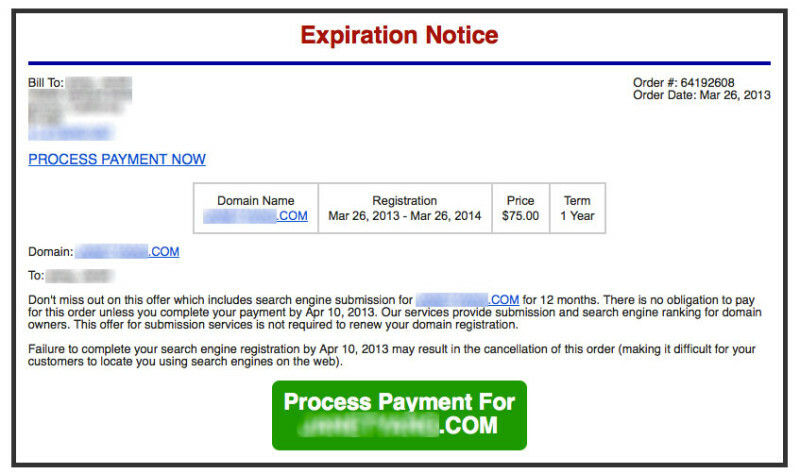 Always make sure your domain name renewal is coming from the company you registered with. We always recommend our clients to check with us before paying any web related bills. Have questions? Give us a call: (213) 245-1057 or drop us a line. We can help you sort this web stuff out. Recurring RSS is an entirely new type of email campaign. In a nutshell, it allows you to automatically send an email to your subscribers whenever you update your site or blog. We then show you elegant reports that make it easy to see what your readers are actually interested in. There are lots of nice touches throughout this feature, but here are a few of the standouts. Just like regular one-off campaigns, we provide you with a detailed report that shows the performance of your recurring campaigns over time. You can easily spot trends over time, dig into what posts were popular for a specific email, and even see what the most popular posts of all time are. We’ve made it easy to add social sharing features to your recurring RSS campaigns. By adding our social sharing tags, your subscribers can easily Like any post on Facebook or tweet about it to their own followers. Using the template editor you can quickly create a great looking mobile-optimized design for your RSS campaigns. We’ll automatically show you your feed content and let you customize how it should be displayed to your subscribers. You can choose to send these campaigns on a daily, weekly or monthly basis. You can get even more granular and send each campaign on the second Monday of every month at 9.25am. We’ll leave it up to you. As well as flexible scheduling, you can also select a range of recipients. It might be a single list, multiple lists or even different segments. This means you can create multiple recurring RSS campaigns and then let your subscribers choose the frequency they’d like to get updates from you. Passionate readers can get daily updates, while others can get a slimmer summary each month. In order to ensure we can guarantee the delivery of your recurring campaigns, you’ll need to be on a monthly plan to access this feature. We started with monthly because it’s easily the most cost effective approach for our customers. If you have less than 50,000 subscribers (meaning you have no send limit), you can send them a daily recurring email for no extra charge on top of what you’re already paying. While automatically sending is great for some, what if you’d like to populate some of your email content from an RSS feed, but not necessarily send it on autopilot. Maybe you only want to include certain posts, or it’s secondary content like a sidebar of upcoming events you’ll be hosting. In the next few months we’ll have another exciting new feature to share that lets you do just that. Stay tuned.